This compass is our "BEST PICK" for overall features. 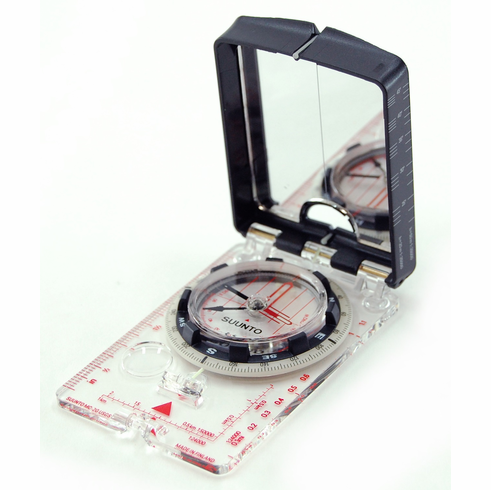 You can use the clear baseplate with maps, sight with the mirror, and never slow your stride with the global needle that accepts tilts up to 20 degrees and still reads accurately. To top it all off, the global needle has a quicker dampening time than a standard needle. Other professional features that make this compass a BEST PICK are the built-in clinometer, adjustable declination, luminous bezel, luminous guidance points, and convenient map scales. This is Suunto's top-of-the-line Navigator MC-2 compass with Suunto's patented global needle for true world-wide performance. Other features include an additional sighting hole for superior bearing accuracy, a luminous bezel, an adjustable declination correction scale, and a built-in clinometer.